We only utilize the latest FDA approved technology. 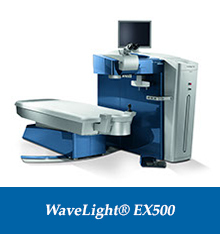 The WaveLight EX500 Excimer Laser system is the newest and fastest laser on the market. Manrique Custom Vision can use this laser system to address a wide treatment range including nearsightedness, farsightedness, and astigmatism as well as addressing glare and halo issues at night. Z-LASIK: More comfortable, less stressful for you! Information provided from www.ziemergroup.com, June 2012. Information provided from www.myalcon.com, May 2014. The decision to have laser vision correction is an investment not only in the quality of your vision, but in the quality of your life. We provide monthly payment options to fit any budget so you can focus on the wonder of your new vision without worrying about how you can afford it. Our doctors and friendly staff are an elite group of specialists dedicated to providing you with the highest quality eye care and laser vision correction. Dr. Manrique is a dedicated Rio Grande Valley eye doctor specializing in refractive surgery. Certified by the American Board of Ophthalmology, a Fellow of the American College of Surgeons and the American College of Eye Surgeons, he is the Medical Director of Manrique Custom Vision, a leading Texas Z-Lasik and eye surgery practice with locations in San Antonio, Harlingen and McAllen-Edinburg. Dr. Manrique was a professor at the University of Texas and has been a professor at Texas A&M University and the Scott & White Clinic. He is a member of the American Academy of Ophthalmology, American Society of Cataract and Refractive Surgery and International Society Refractive Surgery. Dr. Manrique de Lara is a trainer and proctor for the IntraLase and WaveLight Laser systems. 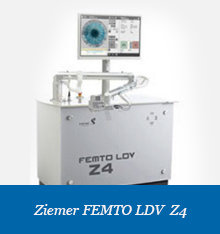 He is also a Medical Advisor for the Blade-Free Ziemer Laser (Z-Lasik). Click here to view Dr. Manrique’s LinkedIn profile. Dr. Ashley McClure is a Texas licensed optometrist that focuses on LASIK evaluations and post-surgery care. Dr. McClure received her Bachelor of Science from the University of Texas at San Antonio. She then continued her education to receive her Doctor of Optometry degree from the University of Houston College of Optometry. Heriberto Manrique de Lara attended St. Mary’s University in San Antonio, Texas where he received his Bachelor in Biology and Chemistry. He also attended Yale School of Management in Summer of 2006 – Ophthalmic Administrator program. He joined Manrique Custom Vision as Assistant Administrator in 2003. In early 2005 he became Administrator for the practice. He has been part of the successful growth of the practice and has overseen the development and opening of offices in Harlingen, The Woodlands, and San Antonio. “Beto” Manrique is a member of the Association of Ophthalmic Administrators (ASOA), and has served on the Board for the Better Business Bureau for Houston and Rio Grande Valley, and the McAllen Hispanic Chamber of Commerce as Vice Chair of International Trade. He is a former member of the Kiwanis Club and was founder of the Mexican Student Association in St. Mary’s University. Click here to view Beto’s LinkedIn profile. Richard is Director of Operations for Manrique Custom Vision. He started out at The Woodlands location 7 years ago. After helping build the clinic he was transferred to the newest location in San Antonio where he oversees marketing and patient satisfaction. Extensively trained in all aspects of the eye, Richard has consulted thousands of patients on LASIK, PRK, and ReSTOR lens for cataracts. Prior to his role at Manrique Custom Vision, Richard started his career in refractive surgery in Dallas, TX where he was Marketing Manager for a busy practice. He also spent 12 years serving his country in the US Navy, with several tours overseas and ended his career in recruiting duty. Richard then spent time as Director of Admissions at several schools. Richard has 3 children who are the center of his attention when he is not at work. Click here to view Richard’s LinkedIn profile.